Forty-two cool and beautiful alternative style nature freaks from all over Japan showed up at Doshi to hang out and play with me for a couple of days. 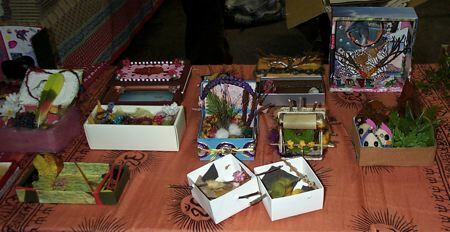 I’d asked that everyone bring unneeded possessions to recycle into decoupage shrines and altars, and people brought lots of lovely things: yarn, feathers, beads, printed graphics, fabric, buttons, small toys, seashells, paper cutouts, stickers, and more. 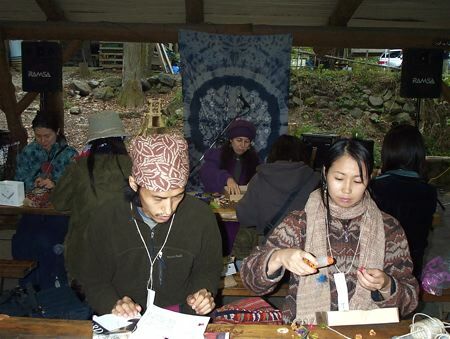 We placed our treasures on the long tables, and everyone circulated, gathering up whatever appealed to them to use in making a shrine. 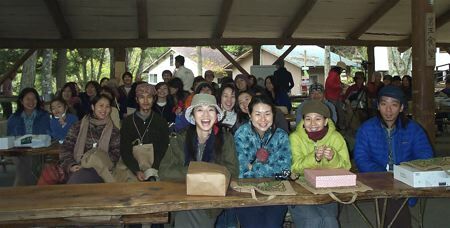 Some of us gathered leaves, twigs or stones from the surrounding forest. The staff provided glue and scissors, plus fixative to add after the piece was complete. 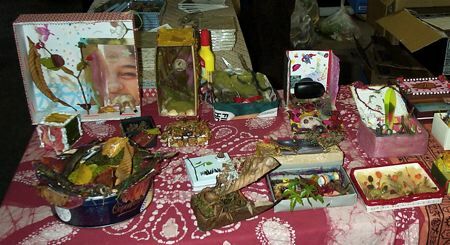 I explained that a shrine or altar is a three dimensional representation of a wish and it sends a message to the Universe to manifest this wish in reality. 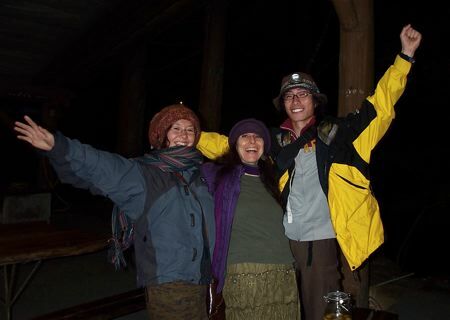 It could be a universal wish, for world peace and environmental sustainability, for example, or it could be a personal wish for an outer experience or an inner change. The elements of the shrine need only have meaning for the artist. Through the focus created by making a shrine, the wish constantly attracts energy to itself, and eventually manifests in time/space reality. I was astonished at the variety and intensity of our creations! 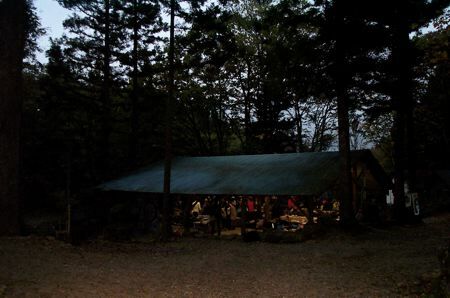 One shrine was built of forest twigs. 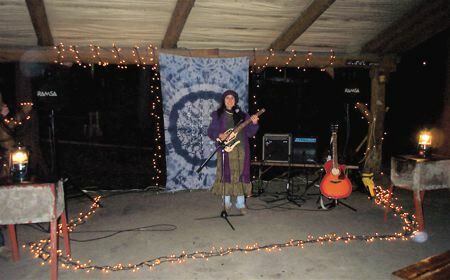 Another incorporated an electronic shimmering peace sign that went through five color and design permutations in its sequence. 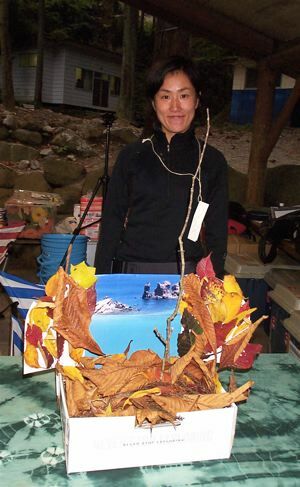 This lovely woman made the largest shrine, full of leaves from the forest. 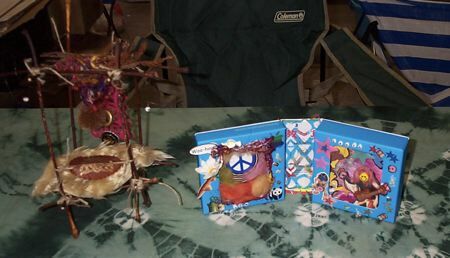 My shrine (on the right) is about caring for the planet. I used a shoebox lid from Greentoe Sustainable Shoes, a postcard advertising a Japanese edition of The Little Prince, the cover art from an issue of 88 Permaculture Magazine, floral kimono fabric, yarn made from recycled saris, a California bay laurel leaf I found in my suitcase, sprigs of dried pine from the Doshi forest, seashells, a tiny broom someone brought (to help the Little Prince clean his planet), a candy wrapper I found on the ground at Doshi, two botanical photographs, five buttons, a leather tag on a hemp cord, and a cutout made from origami paper. I didn’t finish it at Doshi, and added a few more elements after I took this photo. I plan to photograph my shrine and make it the image on my holiday card for this year. Most years I make my own cards. For me, holiday cards are thank you notes to people whose presence enriched my life during the year. 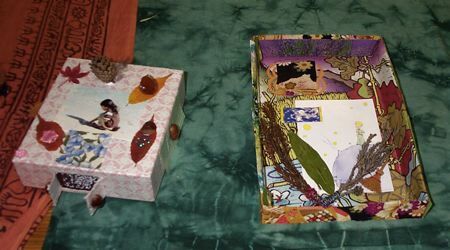 We displayed our shrines on a table, and marvelled at each other’s work. 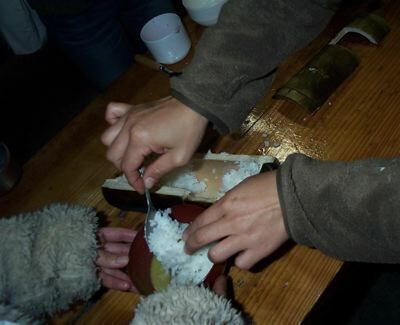 Next we divided into teams and prepared a feast of natural foods cooked outdoors. 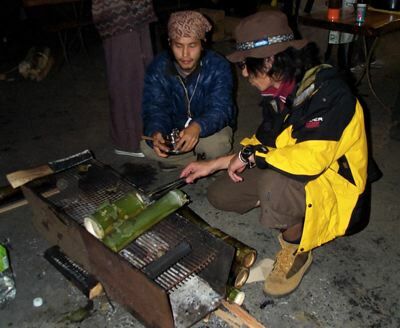 The chef from Kurkku’s restaurant lead the team that prepared chickens for barbeque on the grill. 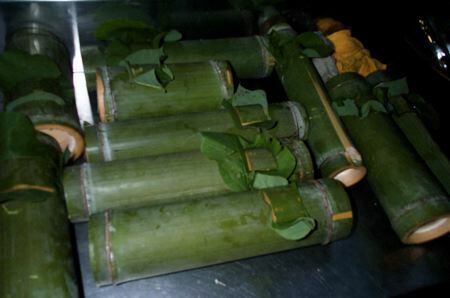 One team filled sections of green bamboo with rice and water to be cooked on the grill, delicately flavoring the rice with bamboo. 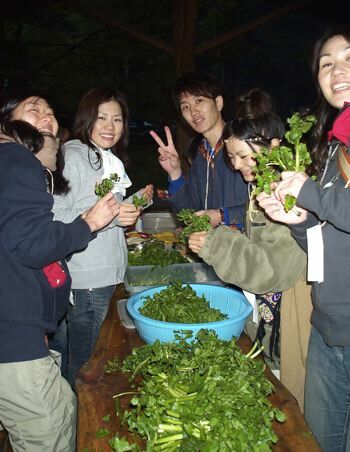 Watercress grows abundantly around Doshi, so we made a green salad with lots of watercress in it. We used the stems as a vegetable in a chicken soup made from the parts of the chicken that were not used to barbeque. I was on the salad team, chopping tomatoes, cucumbers, and scallions. For the curry, we needed peppers and onions cut up. 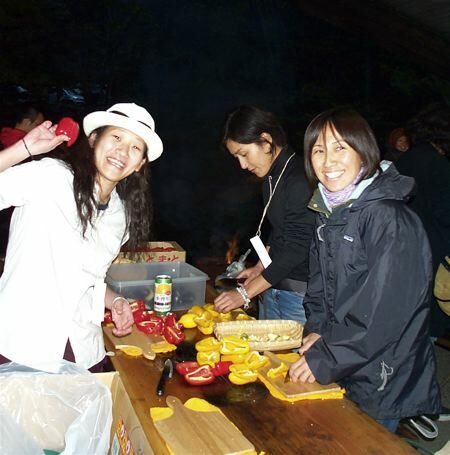 The cute girl with the hat in the pepper photo is Rina Usuki, owner of Think Garden bookstore in Hokkaido, who invited me to visit next summer. 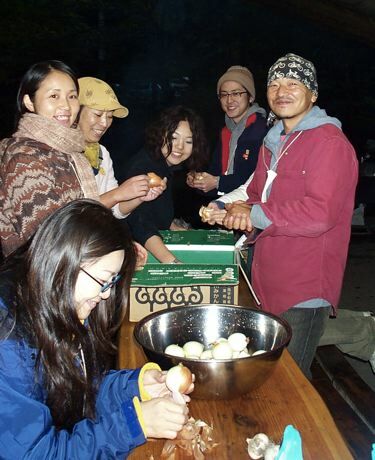 By evening, we had prepared dinner for sixty. 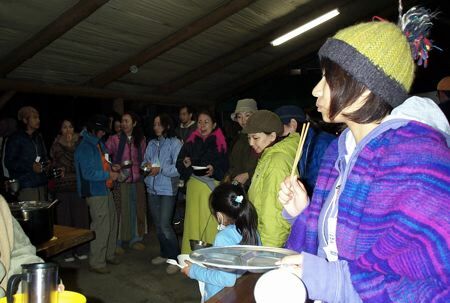 Everyone brought plates, bowls and chopsticks, so that very few disposables were used, and everyone washed his or her own dishes. 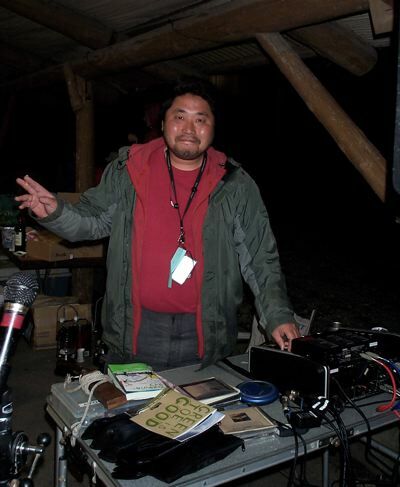 …and the staff made a stage of twinkle lights inwhich I performed a story and music show. 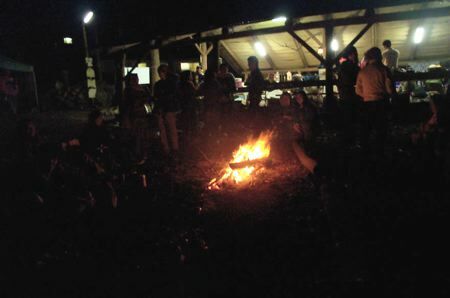 After my show, people gathered around a bonfire. I visited with my many wonderful new friends. 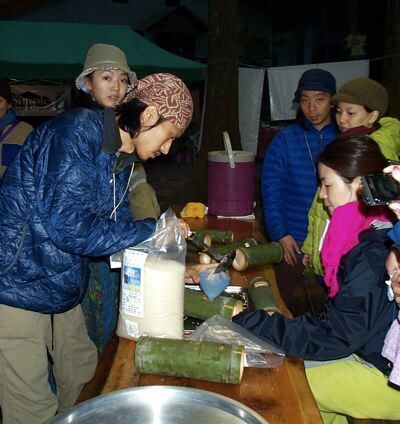 This young couple, Kaku and Yurie, owns and runs Sasulai, an earth-friendly shop in Tokyo.